The ADX indicator measures the strength of a trend and can be useful to determine if a trend is strong or weak. High readings indicate a strong trend and low readings indicate a weak trend. When this indicator is showing a low reading then a trading range is likely to develop. Avoid stocks with low readings! You want to be in stocks that have high readings. This indicator stands for Average Directional Index. On some charting packages there are two other lines on the chart, +DI and -DI (the DI part stands for Directional Indicator). Ignore these lines. Trying to trade according to these two lines is a great way to lose money! The only thing that we are concerned with is the ADX itself. Note: This indicator measures strong or weak trends. This can be either a strong uptrend or a strong downtrend. It does not tell you if the trend is up or down, it just tells you how strong the current trend is! In the chart above, the ADX indicator is the thick black line (arrow). The other lines are the +DI and -DI (ignore these). The highlighted areas show how this indicator identifies trading ranges. 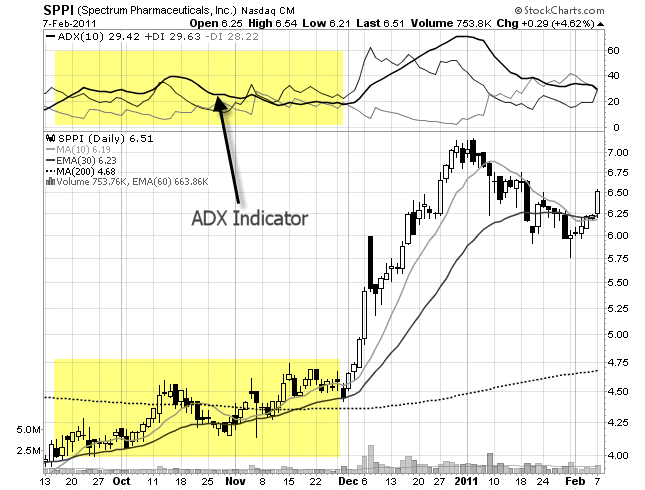 ADX is showing a low reading and the stock is chopping around sideways. Now look at what happens when the indicator gets into higher territory. A strong trend develops! These are the type of stocks that you want to trade. If ADX is between 0 and 25 then the stock is in a trading range. It is likely just chopping around sideways. Avoid these weak, pathetic stocks! Once ADX gets above 25 then you will begin to see the beginning of a trend. Big moves (up or down) tend to happen when ADX is right around this number. When the ADX indicator gets above 30 then you are staring at a stock that is in a strong trend! These are the stocks that you want to be trading! You won't see very many stocks with the ADX above 50. Once it gets that high, you start to see trends coming to an end and trading ranges developing again. The only thing I use the ADX for is an additional filter in my scans, so that I can find stocks that are in strong trends. I do not even have the ADX indicator on the charts that I look at when I am looking for setups. Since the ADX is already factored into the scans, I don't need it added to the chart itself. I don't pay any attention to the rising and falling of the ADX indicator. Stocks can go up for long periods of time even though the ADX may be falling (indicating that the trend is getting weak). The ideal scenario is that the ADX is rising, but I don't find it necessary to take a trade. I don't use any technical indicators on my charts. I found out that technical indicators just clouded my judgement. One technical indicator may indicate a buy and one may indicate a sell. Needless to say, this can be very confusing and it just takes you attention away from the only thing that matters - PRICE. So what is the ADX indicator good for? This indicator is best used for screening stocks and writing scans. By adding this indicator to your scanning software, you can eliminate all of the stocks that are in trading ranges. You can then set up your scan to find only those stocks that are in strong up trends or strong down trends. The ADX indicator does not give buy or sell signals. It does, however, give you some perspective on where the stock is in the trend. Low readings and you have a trading range or the beginning of a trend. Extremely high readings tell you that the trend will likely come to an end.